Money orders are helpful tools for shopping. They are a safe form of payment for sellers (as long as they’re legitimate) because there’s almost no risk of a money order bouncing. But that safety makes it difficult to buy money orders with a check – cash is the preferred method of payment, and some issuers accept a debit card if you use your PIN. Money order issuers are careful about the forms of payment they accept. Cash is best because they can be certain that they’re getting paid – they’ve got cash in hand instead of a promise from somebody else. That’s important because money orders are a form of “guaranteed” payment: the money order issuer guarantees that the funds will be there whenever the recipient goes to cash or deposit the money order. Instead of relying on you (the buyer), the money order recipient can rely on the money order issuer – which is often a large, well-known financial institution. Checks Are Risky: in order for the money order issuer to make that guarantee, they need to know that they’re going to get paid by you. Once your money order is printed by the issuer, the issuer's money is as good as gone – they can’t easily get it back from you. If your personal check bounces, presumably they can try to track you down and collect the money you owe in the legal system (by taking you to court), but that’s expensive and not something they’re interested in doing. 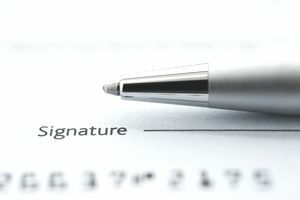 If you’re a fan of writing checks, you still have several options – but writing a personal check to the money order issuer is probably not one of them. Pay by Check: instead of paying with a money order, can you just write a check to the seller or merchant you were going to make the money order out to? They might normally request money orders, but you can always ask if it’s okay to send a personal check. Especially if you’re a regular customer, that might be fine. However, you might prefer not to send a personal check. Your checks reveal personal details that you might not want to share with a merchant. For example, your checks have your full name, address, and bank account numbers, and it might be best to limit who can see that information. Go to Your Bank: if you’re hoping to write a check for a money order, you might be able to accomplish the same thing – paying out of your checking account – by getting a money order from your bank. Your bank will know if you have the funds available in your account, and they can take those funds immediately (so they’re not taking the same risk that a money order issuer would take by accepting checks). You shouldn’t even need to use a check – the bank can just transfer the money. Credit Union Member? If you use a credit union, you might not even need to go to your credit union’s branch. If your credit union is part of a shared branching network, you can visit thousands of other credit union branches nationwide, many of which will issue a money order for you. Write a Check for Cash Back: depending on where you buy your money orders, you might be able to write a check for something else (like groceries) and get cash back. Ask the customer service desk or cashiers if this is possible, and what the maximum limits are. Traveler’s checks: money order issuers don’t like personal checks, but they might accept traveler’s checks. Unfortunately, it’s probably easier to use one of the other strategies on this page. Cash advance: if you have a credit card, some money order issuers will let you use the card to get a cash advance, or you can get cash from an ATM. This is extremely expensive, and should be done only as a last resort. Your credit card issuer will charge hefty fees, you’ll pay interest at a higher rate, and your credit card issuer will probably apply your payments to that higher-rate balance last. If you don’t pay off the balance immediately, this becomes especially expensive. Debit Card Cash Advance: if you can’t use a debit card or get to your bank, it might be possible to go to a different bank and get a cash advance using your debit card. You’ll pay a fee, but it might get you out of a pinch.